1. Wash out the coffee tin and dry. 2. Use a craft knife to cut out a slit in the lid. Ensure it is big enough for coins and notes to be pushed through. 3. Cover the lid with your chosen Dovecraft Travel Washi Tape design. Flip over and recut the hole. 4. Paint your tin white to ensure the Washi Tape stands out. Leave to dry and carefully wrap your Washi Tape design around the tin, making sure to overlap the strips slightly to avoid any gaps. Now your tin is ready to be filled with money for your next journey! You can also get upcycling with these Washi Tapes to create a statement home décor piece! Maxine has alternated the Dovecraft Mermaid Washi Tape designs to make this ‘&’ really pop. Pegs are super useful around the home but if you want to spruce them up, simply stick a line of Washi Tape on to the peg. The holographic design works really well on this item and these pegs would be fab for holding up your ever growing Washi collection. 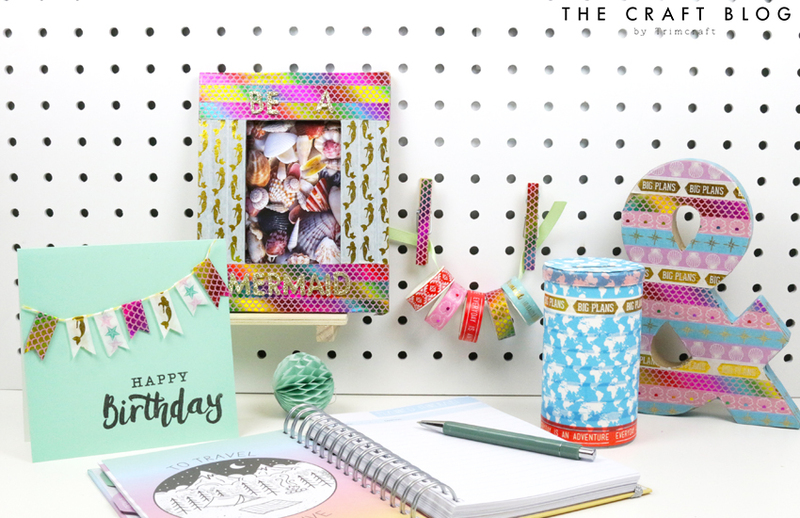 Keeping with the upcycling theme, you could transform an everyday frame with a mystical touch using the mermaid Washi Tape. Maxine has used different designs for each side to really make this an eye catching item. If you want to keep it simple, you could also create Washi bunting with your chosen designs and adhere it across your card blank. Colourful and classy! What do you think of these Washi Tape projects? We can’t wait to see yours so don’t forget to #trimcraft when uploading to social media and to share your makes in the Inspiration area. These Dovecraft Washi Tapes are exclusive to Hobbycraft so remember to pop in to your closest store to pick up yours!